Although the constellations in the heavens do not form configurations that are definitively human, animal or vegetable, promoters of the false 'Gospel in the Stars' are of the same opinion as astrologers that Virgo holds a Branch, and that this Branch represents 'the Christ' who will come to redeem the world. E.W. Bullinger actually stated: "The day has here come to fulfill the prophecies concerning Him who is 'the Branch,' 'the Branch of Jehovah,' 'the man whose name is the Branch. '” (939) Knowing that Virgo is the Great Mother Goddess of pagan religions, the Scriptures cited by Kennedy and Bullinger will undoubtedly be used to validate a false Christ, who will be promoted as 'The Branch' and whose name will actually mean "branch". "Eve or Hawwah is explained by Robert Graves as possibly being the Hebrew version of Heba, Hebat, Khebat, or Khilba. She is depicted as riding a lion in a sculpture. She was worshipped in Jerusalem. Her Greek name was Heba, Heracles' goddess-wife. From the 5th to the 8th centuries, the Merovingian dynasty ruled Europe and, from the Middle Ages until the present day, most of Europe's monarchs have been of Jewish descent. 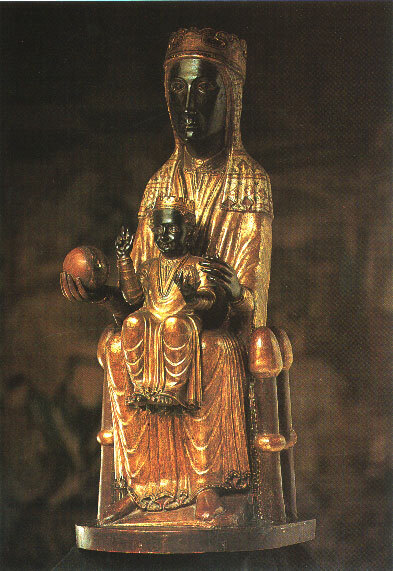 The Merovingians kings claimed Jewish descent from King David, King Solomon and, posturing as Christians, from Jesus Christ through Mary Magdalene. The first Merovingian king of France, Clovis I, feigned conversion to Christianity in 496 A.D. along with his Jewish household and 3,000 of his Jewish warriors. 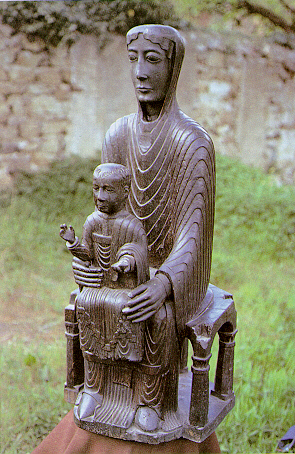 Recall that the Society of Ormus which originated in Alexandria, Egypt had relocated to Calabria, Italy and that, in 1070 AD, twenty-nine years before the first Crusade, the Calabrian monks removed to Ardennes Forrest in France, part of the domains of Godfroi de Bouillon who was the duke of Lorraine. Godfroi de Bouillon who became the King of Jerusalem and first Grand Master of the Knights Templar was a descendant of King Dagobert through Hugues de Plantard. From these Jewish families descended the Saint-Clair (Sinclair) and Plantard bloodlines, as well as the Hapsburg dynasty which is allied with Plantard through the House of Lorraine. There are compelling reasons for our conviction that the Antichrist will come from the Plantard and Saint-Clair bloodlines. Supporting evidence for this view will be presented throughout this series, as well as information leading to discovery of the identity of the False Prophet, a Merovingian as well. According to The Messianic Legacy by Baigent, Lincoln and Leigh, Pierre Plantard de Saint-Claire joined the Prieuré de Sion on July 10, 1943 and, from 1963 to 1981, shared the position of Grand Master with Gaylord Freeman, also of an Illuminati bloodline. (232:319;235-6) According to Holy Blood, Holy Grail, Plantard de Saint-Claire was Grand Master of the Prieuré de Sion from 1981 to 1984. Anne Lea Hisler, Plantard's wife, worked with her husband on the magazine of the Prieuré de Sion, CIRCUIT, an acronym for "Chivalry of Catholic Rules and Institutions of the Independent and Traditionalist Union." The prophecies of Nostradamus included "...a number of detailed prophecies concerning Hitler (whom he calls Hisler), naming him as the 'second antiChrist'." Were the Nazis secretly under the direction of the Priory of Sion? "The SS was regarded by some ideologues as a supranational order, along the lines of the Templars. These ideas, which were in opposition to Hitler's policies, made up the core of a document known as the SS Charter. It was signed by Himmler himself, future leader of Eurasia according to the charter's designs. Hitler, burdened by narrow national prejudices, was to inherit the lesser role of pan-German Fuhrer. Among the principles of the SS Charter were rights of the individual and ethnic group, division of labor in Europe and freedom of religion. The term 'United States of Europe' was employed. Will the predicted revived Holy Roman Empire instead be a revived Merovingian Empire? The Grand Master of the Prieuré de Sion since 1989 has been Thomas Plantard de Saint-Clair. According to Holy Blood, Holy Grail, Thomas is the son of the former Grand Master, the late Pierre Plantard de Saint-Clair. The following announcement of Thomas' election as Grand Master was published in the internal bulletin of the Prieuré de Sion in 1989, and only recently posted on the Internet. According to Marjorie Reeves' Joachim of Fiore and the Prophetic Future, a second Charlemagne will arise whose surname begins with 'P'. The Prieuré de Sion was formed and has been directed by individuals related to the Saint-Clair bloodline. In Great Britain, the surname of this so-called sacred lineage is Sinclair. According to at least two Masonic sources, the Saint-Clairs are Grand Masters of Freemasonry by right of birth and they have historically controlled the Prieuré de Sion. In addition to conditioning the masses to believe their New Age propaganda, another objective of best-selling New Age books such as Holy Blood, Holy Grail is to covertly communicate secret information from the Prieuré de Sion to a specific audience—the global network of secret societies and New Age cults, all of which eagerly await the end of the Age of Pisces and the beginning of the Age of Aquarius. At that point in time, the much despised Church Age will come to a close and Lucifer, in the person of the Antichrist, will reign over a Golden Age, having destroyed the Harlot Church which no longer serves his purposes. 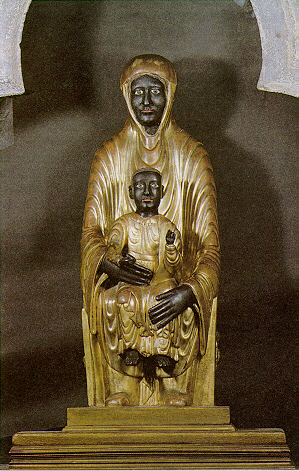 Notre Dame de Meymac, also known as the Black Madonna of Meymac is believed to have been carved sometime during the 11th century. 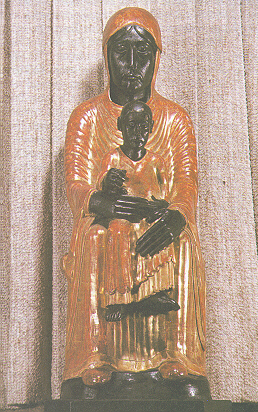 The Black Virgin has very large hands and a red cloak; and has been called one of the strangest and most interesting Black Madonnas to date. 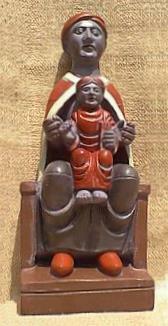 The Child is dressed in red with bare feet, and sits between the Madonna's knees, holding a closed book in his left hand. Will Thomas Plantard de Saint-Clair be revealed as the reincarnation of Horus, i.e. Nimrod, who will at last unite the world under Lucifer? Recall that the myth of Horus is a distortion of the Genesis account of God's judgment on the Tower of Babel. (Gen. 10 and 11) Not happy with this arrangement, New Agers anticipate the return of Horus as the reincarnation of Nimrod who will finally unite mankind in a glorious revolution which dethrones God.